Founder and Executive Director, Rachel Whitehawk, is an American motivational speaker, Certified Professional Life Coach and Certified Recovery Coach, High-fashion model, image consultant and author of life changing curriculum. She espouses the virtues of genuine self-worth, behavior modification, balanced thinking, stress reduction and goal setting using her unique cognitive patterning method. She has been a guest on many national talk shows sharing her life strategies. Her talk show appearances have included Geraldo, Sally Jesse Raphael, Ricki Lake, Montel Williams, Rolanda, and News Talk Television. Rachel is a life-long seasoned equine rider and performer on horseback, and a motivational speaker sharing her life strategies and unique curriculum for girls. Rachel has been a consultant to various non-profit organizations, media organizations, and political candidates. 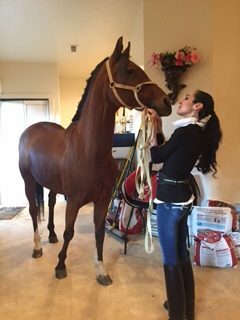 Rachel has created a unique wellness philosophy utilizing her own life experiences, her education in health and knowledge of horses. She founded Whitehawk Ranch in 2003 to provide teen girls and women in all walks of life the opportunity to achieve their optimal health and happiness. She works with area homeless and youth shelters to provide these and additional job readiness programs for women in Summit County. In connection to Whitehawk Ranch, Rachel also launched ROLE MODELS INC., a blog page to this website that helps girls and women to understand how moral values can work in the current fashion culture and how young women can express themselves without succumbing to the detrimental effects of media messages in our society. Rachel’s unique curriculum has come from her unique life. Growing up in an emotionally heathy family did not make Rachel immune to the struggles she talks about in her work with girls and women. Rachel changed her life by changing her thinking. She knows the value of taking the time to reconstruct our perceptions, ideas and values to enable us to live the life we were given and to free ourselves from societal influences to live out the purpose of our life with joy and peace of mind.